UPDATE, 3/20/2019: Councilmembers Miguel Arias, Esmeralda Soria and Nelson Esparza formally announced their opposition to the ordinance written about below. They are holding news conference Wednesday (March 20) afternoon. With councilmen Steve Brandau, Paul Caprioglio and Luis Chavez sponsoring the measure, that leaves the seventh council member, Garry Bredefeld as the swing vote. “I’m listening and will make my decision tomorrow,” he tells Politics 101. The Fresno City Council will hear a plan to ban drivers from handing anything from their vehicle to a pedestrian. In other words, it wants to eliminate panhandlers from collecting from passing cars. Co-author Steve Brandau (District 2) says it’s about safety. “It is to stop negative behaviors, which is interactions between moving vehicles and pedestrians — putting people and property at jeopardy,” Brandau said. “The City must pursue solutions to Fresno’s housing insecurity, not police acts of kindness of residents,” wrote Ashley Werner of the Leadership Counsel for Justice & Accountability on Twitter. Councilman Miguel Arias (District 3) indicated he would not support the bill. “Government shouldn’t have a role in telling me who or how I should give my charitable contribution to. So much for the GOP’s smaller government platform. I hope that is clear enough for you!” he wrote on Twitter. It applies to vehicles either waiting at a stoplight, within 200 yards of a “signalized intersection,” or illegally stopped. It would not apply to parked cars. 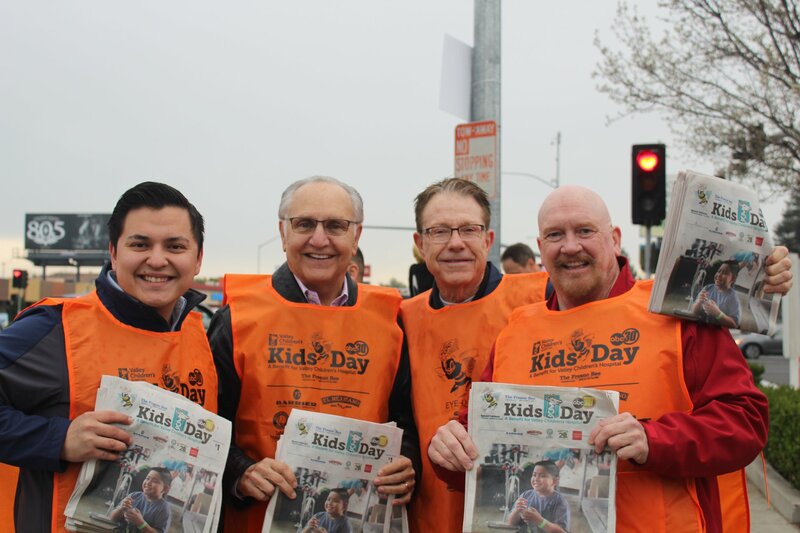 Could the ordinance apply to one of Fresno’s top fundraising events, Kids Day, the annual Valley Children’s Hospital fundraiser, which sells newspapers from the streets of Fresno? Brandau and the foundation that runs Kids Day says no. STOP exempts groups who have a valid permit to utilize city medians. However, the ordinance does not specifically address giving money (or other possessions) to someone on a sidewalk. Councilmen Paul Caprioglio (District 4) and Luis Chavez (District 5) are co-sponsors. It is scheduled for a 3 p.m. hearing at council chambers on Thursday (March 21). Mayor Lee Brand and other city officials held a closed-door meeting with supporters of the failed Measure P parks tax on Monday (March 18). Participants from both sides of the issue said the meeting went well, though none were willing to talk on the record. While the group discussed how to potentially proceed with a modified tax initiative in the future, nothing tangible was agreed upon. Measure P garnered 52% in the November 2018 election from city of Fresno voters, short of the required two-thirds needed to pass. However, that threshold is being challenged in Fresno County Superior court. The next hearing is in June. Related Story: Did Fresno Parks Tax Pass? Courts Asked to Decide. Measure P would have raised the city’s sales tax three-eighths of a cent, with proceeds directed toward parks and related programs. A special election for the soon-to-be-vacant Fresno city council seat of Steve Brandau will likely occur in August. Brandau says his last council meeting will be April 4. He will be sworn in as a member of the Fresno County Board of Supervisors on April 9, after winning a special election for that office two weeks ago. Neither an exact date nor a cost estimate is available yet. The Fresno city council can’t declare a special election until Brandau officially resigns. They have up to 30 days after to call for a special election, and that election can be held no sooner than 90 days thereafter. While those variables would allow for a July election, August appears more likely. Fresno elections clerk Brandi Orth certified Brandau’s March 5 special election win on March 14. So, why is Brandau not leaving sooner? “I have loose ends at City Hall to tie up,” he tells Politics 101. He added that he would not be sufficiently up to speed on agenda items requiring his vote at the next supervisors meeting on March 26. He wants more time to study the issues and speak with department heads. Three candidates who intend to run in the special city election have already filed paperwork to run for Brandau’s council seat: financial planner Phil Arballo, businessman Mike Karbassi, and security firm operator and city planning commission member Lawrence Garcia. Their filings are based on the original expiration of Brandau’s term in March 2020, which permits them to raise money before the special election is declared. More candidates are likely to jump in. If needed, a runoff would take place Nov. 5, which is the date of the next scheduled election on the state calendar. Brandau hedged his bets when asked if he would be willing to fund the cost of the special elections necessitated by his impending resignation. “I’ll look at it, but I don’t know if I’ll do anything about that,” he said. On a side note, this special election will still be conducted using existing voting procedures — including precincts and vote by mail options. The Voting Choice Act, which Fresno County recently approved, does not go into effect until 2020. Related Story: A New Way to Vote? Fresno County Explores Options. The Fresno City Council is at it again, by trying to pass another law that does not address the problem at hand. The Council previously passed a law making it illegal to panhandle from the center median at intersection. The Fresno PD is too busy to right citations, and even if they did, many of the recipients are homeless with little or no means to pay the fine. Now the Council wants to fine the driver, or passenger of a car, for a charitable act. The Council claims that this is a safety issue. This is now more a safety issue than the annual Fresno Bee’s Kid’s Day, or the Fire Department’s Fill The Boot campaigns. The difference is the orange safety vests that are distributed to the volunteers that stand on the corner shouting for donations. Perhaps the City Council should take a benevolent approach and require those in need to wear orange safety vests. If this should pass, the first citation issued will get national press coverage about the City that punishes its citizens for acts of kindness. Yes, there is a problem, but this is not the solution. The Council needs to think with their hearts, not their eyes.